Stratford and Leonie Caldecott established the Centre for Faith & Culture some seven years ago. The Centre is now housed in Plater College at Oxford in the U.K. and is having some considerable influence. It all began as a kind of "evangelization of culture," explain the founders, in this interview with Catholic World Report. Through the cultural supplement to Catholic World Report called "Second Spring," which ran every few months from 1992 to 1999, readers began to be aware during the last decade of yet another movement of cultural and religious renewal in Oxford that famous city which has seen many religious revivals over the centuries, including Methodism, the Oxford Movement, and the Inklings. The "Second Spring" supplement was produced by the Centre for Faith & Culture, which, although Catholic in inspiration, was founded originally at a Methodist college. The Centre is now located at a Catholic college named after the Jesuit priest Father Charles Plater, who died in 1921. The Jubilee Year saw a number of important developments for the Centre. A website has been designed (www.secondspring.co.uk). A newly established organization for Catholic artists and architects is being promoted (www.ourladyandstluke.org). And the Centre's free newsletter, the 'Faith & Culture Bulletin', has now been replaced by an illustrated journal called you guessed it! Second Spring. Most recently, the Centre has come under the aegis of the Chesterton Institute based at Seton Hall University in new Jersey. Though it has been working closely with the Institute for some time, the new relationship reflects the Institute's own commmitment to supporting cultural initiatives of which G.K. Chesterton himself would have approved, and to do the kind of things that he would have done were he still alive today. It looks as though the Centre, starting from the tiniest and most fragile of beginnings, is at last becoming more solidly established. In the Fall of 2000, CWR's correspondent visited the founders of the Centre, Stratford and Léonie Caldecott, in their Oxford home. I wonder if you could tell me something of the aim, the vocation, of your Centre, and how it came to exist. Stratford Caldecott: We started it about six years ago, the aim I suppose being a kind of "evangelization of culture." My own background was mainly in publishing. Léonie and I met and married at university in Oxford, as a matter of fact. Neither of us was a Roman Catholic at the time. After leaving university I became a publisher, as my father had been. Léonie and I lived in London, and then for a few years in Boston. It was around 1980 that I became a Catholic (Léonie joined me a couple of years later), and soon after that I began to look for ways of serving the Church through publishing. By 1990 I was increasingly frustrated working for large companies. I wanted to be freer to organize conferences and other events to communicate something of the beauty of the Catholic faith that we had discovered together. So I resigned my full-time job, and we both moved back to Oxford to work on a number of projects: some publishing work for the Scottish firm T&T Clark, for example, but also organizing a conference in Zagreb on "ethics and economics" for the Chesterton Review, and writing and editing a new section for Catholic World Report. We called it "Second Spring" after John Henry Newman's famous sermon of 1852, in which he speaks about a coming revival of Catholicism in England. We felt it was important to try somehow to create a place where people could come together to explore the faith. We were finally able to do it in a tiny way with the help of Westminster College, a Methodist college on the western side of Oxford. They offered me a research fellowship, while T&T Clark paid the rest of my salary in return for the book publishing which the Centre made possible. It was quite a good arrangement: the College got the benefit of a close relationship with a publisher, and the publisher got a free editorial office in Oxford. During the first few years we did a number of things. For example, we organized several conferences, the most successful of which was on the reform of the liturgy, in 1996 ("Beyond the Prosaic," later published in book form under that title by T&T Clark). There were also numerous one-day events, exhibitions, lectures, concerts, and so on. A lot of our work at this time was supported by the G.K. Chesterton Institute. We also started publishing a newsletter called Faith & Culture Bulletin, which was sent free of charge to anyone who expressed an interest. After three years, the contract expired with Westminster College, which at that time was pulling out of research, and I began looking for a new location for the work. In the end I was able to move the Centre over to Plater College on the other side of town, which is where I am now. Plater is not a Methodist college, is it? Stratford Caldecott: No: it is a small Catholic College for mature students, associated with the University but not part of it. It has a special interest in Catholic social teaching, which is what I teach there. You spoke about exploring the faith with other people. Is the Centre drawing people who are not Christian? Is it becoming a true center of evangelization? Stratford Caldecott: That is a very challenging question. We are both very much influenced by John Paul II and his concept of a "new evangelization" which I think to him means a "cultural" evangelization. That means really that we have to try to reach out to non-Christians and non-Catholics, as well as to people within the Church who have maybe drifted away. So one of our problems is always that of communicating beyond a Catholic audience. We haven't solved that yet. Of course, when we advertise our conferences we try to do it in such a way that anyone is welcome to come. We normally have some non-Catholics present, but we have never consciously designed events for them, though that may come in due course. Our priority was to try to present the faith in an attractive way, to bring out the beauty of the faith, and so hope to draw people toward it. Before we were Catholics ourselves, we were always put off by people who evangelize you in the street or knock on your door. That was never our style. There is a huge mission here. Do you feel you have done what you set out to do? Stratford Caldecott: I think we have hardly started. There is a huge work to be done, and it will only be done if lots of people respond to the same call, each in his own way. We have found that to the extent we have managed to achieve anything, it has always been in collaboration with others who felt the same way about things. I know we have been able to do very little so far; but no matter how small one's capacity, and how few resources one has to bring to the task, it seems that we are all asked to do even tiny things for God. We are struggling to discern the next step: what God wants of us in the moment. Do you think Oxford is an especially good place for this kind of work? Stratford Caldecott: It is a very unusual, extraordinary place. It is an intellectual center that is known all over the world. It is also in many ways a very religious city. You know, you just have to walk down St. Giles and you find almost every kind of religious belief represented by religious houses, one after another, within a few hundred yards from the Oratory to the Christian Scientists and Quakers. All the big religious orders have halls here. It is quite a place, also, for the reception of Anglicans into the Roman Catholic Church. That has been a tradition here ever since Newman, and especially since the decision to ordain women in the Church of England. Most of the Catholics we meet here are converts, of one sort or another. All of this means that in Oxford there is a very dynamic relationship between faith and culture. Converts tend to bring their own cultural experience into the Church, and to reflect upon it intellectually. In that sense alone it is an unusual and exciting place. But there is another reason too. 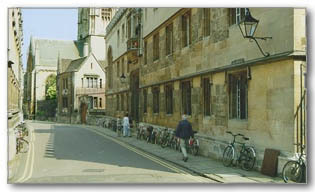 Oxford is important because the separation between faith and culture in our civilization started with intellectuals. The materialism and atheism we see all around us began with an intellectual betrayal, an "apostasy," in which philosophers decided they could pursue truth without reference to God. So really Oxford is a good place to try to understand that apotasy, at the root of the difficulty the Church has in speaking to the modern world. We come across people who are grappling with that problem all the time, both in their teaching and their writing and in their private conversations. But wouldn't you say that the University of Oxford is a very "Christian" place in some ways? Stratford Caldecott: The University in fact all the universities began with the faith. They grew out of the intellectual culture of Christendom in the 11th, 12th, and 13th centuries. For a long time right up to the 19th century they were virtually monastic or clerical in nature. The architecture of the colleges is deeply religious. Just the statues alone remind you of the saints every time you cross the street or turn a corner: just think of St. John's College, Magdalen College, Corpus Christi: Catholic symbols, names, carvings, everywhere you look! What goes on in those buildings, however, is a very different matter. Though there are many Christians here, I think it is difficult to say this is a more Christian university than many others. It is a modern university that happens to be housed in some ancient buildings. The bulk of the work that goes on is detached from reference to Christianity. Can intelligent people be at ease in such a place? Stratford Caldecott: There is a lot of suffering in Oxford. Many of the students are miserable; they are under huge pressure, there are even some suicides. You might think that students would be reminded by the presence of so many churches and so many statues of the saints that there is a transcendent reality to search for, to seek comfort in. I am sure many people do begin a religious search while they are at university, while they are struggling with these pressures, but of course they don't always look in the direction of Christianity. In my own case I was here studying philosophy and psychology I found the academic work all rather arid. I was already becoming interested in mysticism, but soon I began a more disciplined search for the truth in religion, which eventually led me (in rather a roundabout way) to the Catholic Church. I have described some aspects of that journey in Dwight Longenecker's book, The Path to Rome. You spoke earlier of your wish to communicate something of the dignity of the Church. Is this something that is easy for young people to grasp? Stratford Caldecott: Not always! I was lucky to be able to think carefully about my attitude to the Church before I was even baptized as a Christian. Not everyone has that opportunity. I was very consciously joining a Church that taught what I, by then, (after investigation) believed to be true. And I have had no problem with those teachings since becoming a Catholic I have simply discovered greater and greater depths in them. The difficulty is communicating that to others who have been brought up assuming there are serious flaws in the Church's teaching, and who usually aren't prepared to listen long enough to a contrary argument. People always tend to have a vested interest in taking a certain view. They really don't want to listen. They can't believe that you yourself have already thought through all the standard arguments against Catholicism along with a lot of other arguments that have probably never even occurred to them. Plater College has an interest in the social teaching of the Church. How does this relate to faith and culture? Stratford Caldecott: The word "culture" is often associated exclusively with the fine arts. We tend to use it in a broader sense as the Pope himself does to refer to social issues as well. "Culture" is everything that human beings do creatively through their work to transform or shape the world. That includes the attempt to overcome injustice. John Paul II, who speaks of a "culture of life," has shown that Catholic social teaching is rooted in a kind of prophetic analysis of the underlying assumptions that shape our society and the way we live. We often don't recognize that there are cultural and philosophical assumptions built into the way we spend our time, the way we work, the way we earn and invest and spend our money. What am I? What am I living for? What are my priorities? What is right and what is wrong? The way I choose to live reflects the answers I might give to such questions. So the connection between the social doctrine of the Church and the culture we inhabit and take for granted is very strong and close. The social doctrine of the Church is to a large extent a critique of the culture. Is the Pope addressing himself to the question of human happiness, or to what makes people happy and fulfilled in their lives today? Stratford Caldecott: Everyone, without exception, is involved in the search for happiness. No one wants to be miserable. The question is really whether we can be happy being selfish, or whether we can only be truly happy lastingly happy by overcoming that selfishness, and by allowing ourselves to be transformed by God's grace. Religion is a challenge a challenge at the very deepest level. There is such a huge gap between the teaching of the Church and today's society. Do you think that modern technology makes this worse somehow? Stratford Caldecott: It is true that one of the biggest difficulties we face, in communicating our faith, is the rapid social change that has been brought about by technology. Science develops so fast that traditional ways of life are increasingly undermined. It becomes hard for people to relate emotionally, imaginatively to the world as described by the Church and by the Holy Scriptures. That all seems so old-fashioned, so boring, to people who are living imaginatively in the fast lane of the electronic highway, the "virtual" world of the computer or TV screen. But at the same time, one has to say that Catholic social teaching does reach out and does make sense to many people who are not particularly interested in religion or the Church or the Bible. They recognize it as a sane and humane way of organizing society. Community is important, morality is important, trust and respect between people is important, the family is important. These are priorities that make sense to people, whatever background they come from. They can see the danger of these things crumbling. So the social teaching of the Church is a very important aspect of evangelization. It enables us to find common ground: something we can agree on. There are better ways of organizing society, ways that respect what we really are as human beings. Let's talk about it. Let's try to reflect on what makes life meaningful. Léonie, let me ask you what you think about the challenges facing Christian evangelization in Oxford? Léonie Caldecott: Oxford is naturally one of the world's great intellectual centers. So here we are confronted with the need to bring the propositions of faith in contact with some very high-powered minds: it is a question of "faith and reason," Fides et Ratio. There is a spiritual need along with that, which is to counterbalance the mental pride which is a besetting sin of intellectuals and, in a way, of the Western world in general. So there are two things. One has to be convincing; one has to have tested the propositions of faith against human reason, and to have understood the way reason works in order to be able to speak to people who depend on it entirely. And at the same time it is important to have a spirituality which is a genuine cure for that intellectual pride. For me, the response has to be in terms of St. Thérèse of the Child Jesus and her "Little Way." It is only the way of spiritual childhood that can stand against it. That is why we invited Father Marie-Dominique Philippe (the founder of the Community of St. John in France) to give a couple of retreats here. He very much combines these two elements: the intellectual approach and the very simple, very childlike spirituality which of course is Marian as much as it is Theresian. Is there a gap between believing and doing? Can we do more by grace than duty? Léonie Caldecott: Yes, there is a gap. There is always a gap, and the older I get the more important I think that is. We really have to try and close it, but we cannot do everything by ourselves. Take something very simple and very central (which connects with our interest in the liturgical movement). The profound respect with which we behave towards God when we go to church should be reflected in the way we treat our brothers and sisters inside and outside the church, on Sunday or on Monday morning. As our love for God increases, so should our love for our fellow creatures. Why is there such a gap between these things? It is very important to have a dignified liturgy and a prayerful atmosphere in church, so that it won't be like a political rally. But at the same time that profound dignity should be applied to human beings as well. Jesus said, "Love one another as I have loved you." For me that is everything; that is the call. Of course, it is not always possible. Sometimes we are weak, sometimes overburdened, but as Christians we have to try to bring these things together. It is very important, I agree. If we could see more of that, society would be much healthier, families would be healthier. Léonie Caldecott: The whole principle of evangelization is simply the person: the person in his way of life; the person and the way he is with others. People don't listen to each other unless there is a basis of friendship, real friendship. But it isn't real, either, if we are simply "targeting" them for evangelization. You can only offer real friendship to everyone on the basis of Christ, of seeing Christ in them. Stratford Caldecott: Christ himself tells us that he is present in the hungry, the naked, the homeless, the stranger, the little child. That is true even if they aren't baptized. Either way, we know that the true self of every person we meet is somehow in Christ. It is that light that we have to see them in. I think that is what happens in friendship, but usually more slowly. We come to see in someone a kind of human beauty that is a sort of secret treasure deep inside maybe something that they aren't aware of themselves, that they can't possibly know for themselves. Léonie Caldecott: To me that is the center of the whole thing. It is the center of Catholic social teaching. It is the center of the family, which you also mentioned. This isn't something artificial; it is simply the spring of life, of grace. Can I pick up on this theme of the family? We haven't spoken much about it, yet it is so important. The family is so broken in society today. And we have the gays arguing against it. Léonie Caldecott: These days, to say that the family based on marriage between a man and a woman is the permanent foundation of society is almost revolutionary. It is counter-cultural. There is still a very solid core of families that stick together no matter what, whatever the difficulties. But the problem is that you can't keep the family together with moralism. It isn't a matter of needing to return to "Victorian values." Back at the turn of the last century, the English writer G.K. Chesterton already saw that the Victorian family was headed for destruction, and for very good reasons. The fire had gone out; the hearth had gone cold. These days you can't tell people about traditional morality; they aren't interested. They would say they have their own morality which suits them better. They want to be free from the authority of tradition. Stratford Caldecott: They might say: as long as I don't hurt anyone else, what's wrong with it? The point we can make now after a few generations of this kind of social experiment is that in the long run it does hurt others, more than you realize. The breakup of families hurts the children: they pass that on to the next generation, and we end up with a society of alienated hooligans. But I'm not saying we can simply go back, to the 1950s, or to the 1850s, or even to the 1250s. Léonie Caldecott: In the end you can only reach people by example. There have to be examples of families that are warm, where there is love. Not that everything goes smoothly all the time, even in a solid family: quite the contrary! But there is a center or a bond that keeps everyone together, and that comes from God. Without that the "family" does not really exist. That kind of family life can regenerate itself, can recover from its wounds. You mentioned the gay culture, which has such a strong influence today. My impression is that this mentality has to do with a kind of narcissism. It is not just among homosexuals, but everywhere: this is a narcissistic society, always looking at my "self," my rights, my gratification, my image, my development. What will truly regenerate culture is the opposite of that. It is self-giving love, Christ's love, which is prepared to empty itself for the other. So for you the teaching of the Church is a challenge to society? Léonie Caldecott: Exactly: a challenge. You can see that very clearly in various reactions to the Pope. On the one hand he is undeniably popular, almost to a miraculous degree. I think that has something do with the fact that he has suffered so much. He has immense integrity. He knows what he is asking of people. He knows where it leads. But he contradicts all the common assumptions in the media about self-gratification. From their point of view, he shouldn't be popular. It doesn't make sense. It only makes sense if you understand his philosophy of the person, and his love of Christ who reveals who we really are. Is it a duty, then, for Christians to be the light and salt of the world? Léonie Caldecott: "Duty" is a very unfashionable word. It sounds like a dry thing, a hard thing, which has nothing to do with love. But in families duty and love go together, even when it is not very gratifying. It is the same outside the family, if we believe in Christ. We need the help of grace. Léonie Caldecott: And we receive it! When I work with children, or when I am writing, I am very conscious that it would be much easier to stay quietly in my corner. Somehow grace pushes you into things. Looking back you recognize the help you have received from God. And God is there all the time, helping us and encouraging us if we make even the slightest effort. Let me illustrate. I find it very difficult to be approached by homeless people on the street. If you give them something, it might only go to drugs or alcohol. But at the same time there is a way in which grace might come to someone in need, just through making eye contact and saying, "I see you, I see your situation and I am sorry for it. I wish you well." There was a particular tramp I was quite afraid of, because he was rather erratic. I tried at various times to smile at him and speak to him as much to overcome my own fear as to remember who he was a person, just like me, created by God. Once, I encountered him in the street, and reached into my purse to offer him some money, but he wouldn't take it. He simply looked at me and said, "God bless you. You do not need anything." Soon after, he died of a drug overdose. I will never forget how he suddenly became lucid, and said that thing to me, which I needed to hear, because at the time I felt like a failure. I had lost the sense that God was blessing me. You speak about people living on the street. There is a lot of poverty in Britain still. Is the Dome that was constructed in London to mark the Millennium, wasting so much money, in line with the new evangelization, do you think? Léonie Caldecott: I cannot really speak about the Dome, because I have deliberately not gone there. But the Dome does seem to represent very well the secular mentality. It says: "Look at our marvelous modern architecture, our technology, and so on!" They even allow a "faith zone," provided it is not too big. Of course it goes horribly wrong. It is very interesting that it has been a failure, and has become a kind of symbol for what is wrong with Britain. I am fascinated by the stories of missionaries going into alien territory like Matteo Ricci, for example, going into China in the 17th century, spending years humbly learning about the culture before he was able to evangelize it most successfully, I should say (although his work was undone later by more short-sighted people). Now, in the 21st century, man is being glorified above his Creator, and we are in a new kind of missionary situation here in the West. God's little sheep are in that Dome. Is technology not a barrier to evangelization? Léonie Caldecott: I have to say I am very ambivalent about some of this stuff. My "feminine intuition," let us say, is very suspicious. No doubt modern technology can be very useful. The Centre now has a website, and in a way this technology is marvelous. But it does seem to appeal to some of the worst aspects of human nature. Very soon a kind of consumerist mentality sets in. We devour information. But what do we do with it? The faith is always spread primarily by personal contact, face to face. The Pope uses modern technology, but his impact is due to the fact that he is on fire with the love of God. What do you think of the Pope's recent "act of contrition" on behalf of the Church? Léonie Caldecott: Funnily enough, when I heard what he was going to do I felt I understood it. Obviously he is not apologizing on behalf of the Church in the sense of confessing "sins of the Church," for the Church is the spotless Bride of Christ. But he knows that as Catholics, as members of the Church, we do not always live up to the mission we have been given. He is speaking of and for that Church of men, that human dimension the visible, earthly, incomplete Church. He is saying let us start again, let us turn around, let us put right whatever has been done wrong. This is nothing to do with politics, nothing to do with balancing one view against another view, nothing to do with who is right and who is wrong. It has to do with the power of repentance. Christ can enter if we repent and heal whatever is wrong. He can make us into the Church we should have been. It is up to me to follow him and beat my breast and say, "Yes, I did that badly. I was not a good daughter of the Church: I was not following Christ." The Pope once said, "In Christ the Church is holy. In us she is sinful." We need to admit that. Then grace can enter the situation. The Pope is so courageous! He knew exactly what he was doing, and no one could deter him. It was similar when he went to Israel. All the press was talking about how impossible that was, how dangerous. He did not go into that situation as a politician; he went in with his prayer, with his mea culpa, and everything turned around one man representing Jesus Christ. He knows what it means to pray, to intercede, to bear the sins of others. He is truly an extraordinary man, without a doubt. He is sustained entirely by grace. I am sure that as a man he must want nothing more than to retire. Only God can sustain him under that cross. He is going to pour himself out to the last drop, and the world will see it, even if they don't understand it. It is a huge testimony. This is what is most needed by the little lost sheep. Léonie Caldecott: Exactly. He is interested in the lost sheep. He is not so interested in the "good Catholic." He wants the good Catholic also to be interested in the lost sheep. There are many movements in the Church, many charisms. This Pope is trying to encourage them all, gather them all together. If we follow a particular charism, it is his. We look to him not in a mindless way, but because he is who he is. If he is saying mea culpa, then we should examine our consciences. If he is looking out for the lost sheep, then so should we. He is entirely directed to the dignity of the human person. This is not moralism, but morality flows from it. Morality is based in the dignity of the person, in knowing what will fundamentally promote that dignity, which in turn is based on the fact of being created and called by God. I think we have to address this question of human dignity a little more. Do you think there is a need to re-educate people about the value of human life? I am thinking of the huge number of abortions, for example. Léonie Caldecott: Yes, but at the same time in re-educating we have to try to understand the culture in which people are living, and the kind of mentality that really does not want to examine what is going wrong within. If you are engaged in a certain lifestyle and you make certain mistakes it becomes harder and harder to admit until perhaps it becomes a major disaster. There is too much invested in thinking, in acting, in those ways. You have to understand the person you are talking to, so that you can enter into their thinking. If I may mention the Pope again, I was very struck while reading George Weigel's biography of him that while he was a parish priest or student chaplain in Poland he would always accompany his people. He would go on walking trips with them, go into the mountains with them, work alongside them, correspond with them. When they could not decide about something he would debate with them, never condescending or patronizing, always with respect for their own capacity to reach conclusions. There is a horrible danger as soon as we start to instrumentalize each other. A Christian approach is one in which we are interested in people as the people they are, interested in their experiences. We have to care passionately about where they have been, where they are going. That is what the Bishop of Krakow was like. It is so funny when the media portray him as blinkered or in some way lacking in human experience. It doesn't correspond to the things he actually did, and the kinds of friendships that he had with people. He is very far from being blinkered. The numbers at Mass on a Sunday are still dropping. Has the "decade of evangelization" been a failure? Léonie Caldecott: Christ fell several times, but he stood up again. We carry on. Joy and hope are the key. It is not a question of winning, exactly: more a question of just being. If you radiate Christ's joy and Christ's love, if you hope for others and for the Church, then everything can fall into place. It is certainly not necessary to throw away the tradition and the teaching of the Church in order to appeal more to modern people. The Second Vatican Council was about aggiornamento. You open the window of the Church not to jump through it and run away, but to say, "Hullo, who are you? What a nice hat you are wearing! Would you like to come inside and see what is here?" You might want to chat at the window for quite a while before inviting them in. But don't just sit inside looking out and saying how dreadful they all are outside, without our tradition. Real openness and genuine friendliness; this is what we need: openness to others and to the Holy Spirit; friendliness, like that of St. Philip when he made friends with the young people on the streets of Rome. We need that kind of warmth especially in Oxford! Micheline Drame "Trying to be Catholic" Catholic World Report (January, 2001). This article is reprinted with permission from Catholic World Report an international news monthly. Micheline Drame is a freelance writer and poet based in Oxford, England.